On the former estate of a Benedictine abbey, near Leuven in Brabant, Belgium, sits a modernist villa built by Jacques Dupuis and Albert Bontridder in 1965. Kanaal takes over the red brick warehouses and grain-storage silos of a former malting distillery, built in 1857. Vervoordt enlisted Belgian architecture practices Bogdan & Van Broeck, Coussée & Goris and Stéphane Beel to mastermind their adaptive reuse. A new recording studio and hotel hybrid has opened in the Belgian Ardennes, offering musicians a creative refuge away from the hustle of urban life. The building’s shiny black façade echoes the veneer of a jewellery case, while black marble floors and carpet in amethyst hues lead customers through a series of rooms named after the main interior spaces of grand Italian residences: Corte, Grande Sala and Stanza del Tempo. 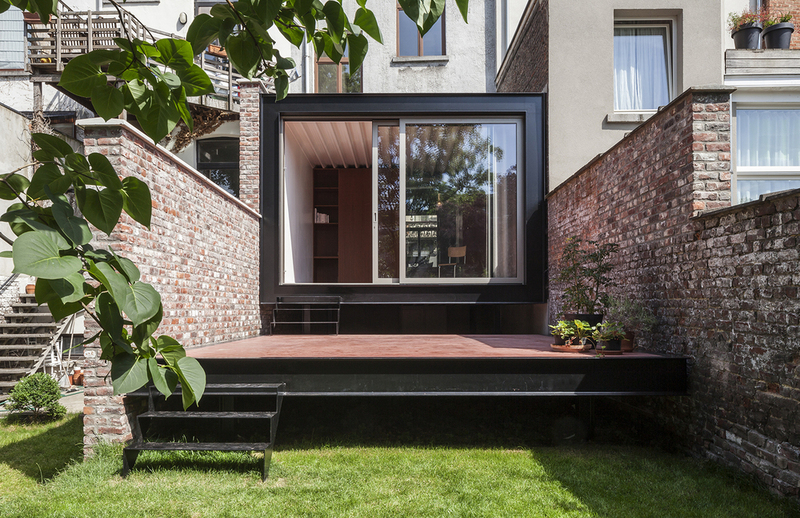 B-ILD architects have inserted a steel box into the historic fabric of a 19th-century house in Brussels. Raised on a platform, this contemporary counterpoint is a response to an irksome subsidence issue causing a disconnect between the building and the garden.